The wonderful words uttered by Collin Farrell in Saving Mr. Banks become especially apt as the nights draw in on us. 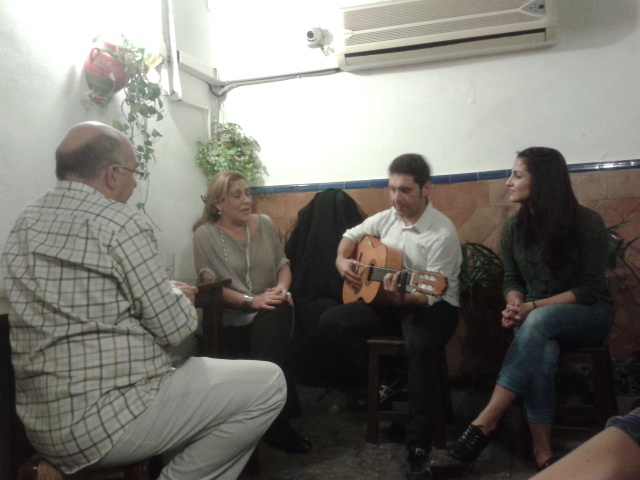 Some nights it is after ten in the evening when I finish work at the Museo Del Baile Flamenco here in Seville. To me as an English native this seems rather late to finish work and sometimes I find myself wanting to jump straight on the bus and get home for an early night. Obviously those readers who work later hours regularly will be thinking that I need to man up and stay up, so I will state my position early on – I enjoy what comes with late finishes here. In Spain, and most of Southern Europe, the warmer temperatures mean that socialising continues far later into the evening and night. Most people won’t even be thinking about having dinner until close to nine or ten in the evening and some restaurants won’t even serve food before half past eight. This in turn means that bar drinks in Seville often keep us out until two in the morning while a full night out could easily place bedtime at six or even seven. So what to me is finishing at an early bed time is to locals merely a late dinner. This means that leaving work at ten in the evening (sometimes on a Friday or Saturday night) is by no means a definite write off of my night. It is rather the perfect time to meet friends at a bar to enjoy some delicious tapas, drinks and as was the case a few weeks ago – have my mind blown upon hearing the Macarena played live as the Spaniards intended it to be heard. But what of these strolls as gifts? Even on the nights when I decide after all for a quiet end to the day and early night after work, my late finishes are a treat when looked at in a certain light. That light, is the moonlight. The narrow streets that make up the historic city centre of Seville look simply magical when light by the moon and I make the most of my night time strolls through them. Readers who like me are proud fans of (500) Days of Summer will remember the scene when Tom takes Summer on an architectural tour of Los Angeles and tells her to look up to the rooftops of the city. Night time is a wonderful time to apply this idea. Partly because doing this during the day in Seville would most likely result in a collision with a car, cyclist or other fans of looking skyward. At night however, the streets are quiet and the rooftops of the old buildings look beautiful against the moonlight. 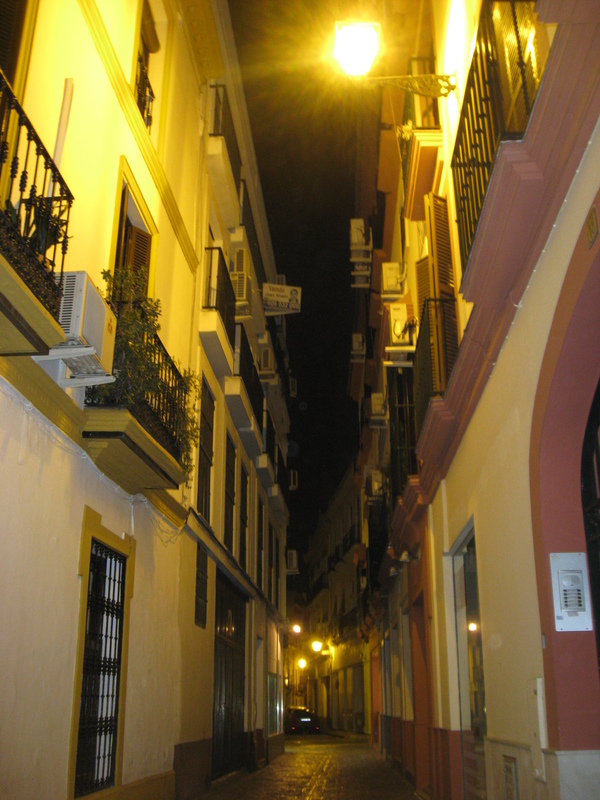 Out of these narrow, moonlit streets there is more enchantment to be found in Seville (and any town or city at night). The monuments such as the awe inspiring Plaza de España and wonderful Cathedral of Seville are lit up by powerful lights at their bases, creating shadows and highlights that would otherwise be invisible. At night there is a juxtaposition of these places being both familiar due to our regular visits, and also mysterious with the new way that the light from below interacts with them. It is interesting how changing the direction of light from coming from above to coming from below can change the way something appears – think about how when telling a spooky tale people like to shine a torch from below their face. In a similar way that different shadows on your face can make you look like a different person, the different shadows on monuments allow us to be intrigued by them in a different way. As the night’s get longer the nearer to winter we get, it is important to not retreat completely into a cosy nest of blankets until the spring (though that actually sounds completely spiffing). The night skies and moonlight shed new beauty into the world that would be a shame to miss. It’s not long until the festive season will light up our worlds in its own magical way but until then, let’s allow the moon to do its job and make our night time strolls all the prettier.